After nearly four months of silence, the 17,000-plus RPM Formula 1 engines lit up in Australia for the start of a 2011 season. 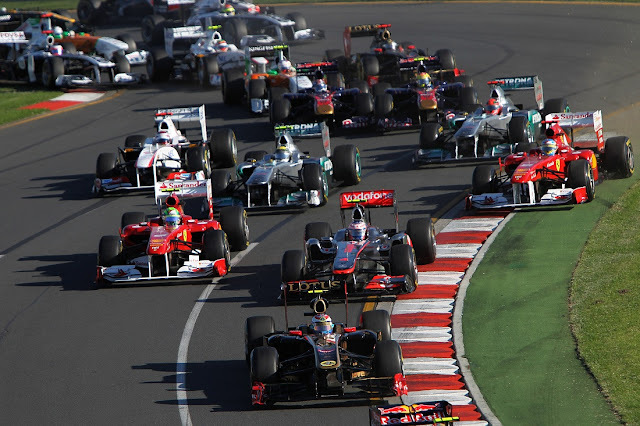 The 2011 Australian Grand Prix was the premiere showcase of open wheel teams and drivers eager to gain momentum into an uncharted year. Featuring new drivers, new colours and new rules, the qualifying for the Australian Grand Prix was a case of the more things change, the more they stay the same. Making the run for pole, the Red Bull-Renault and McLaren-Mercedes cars were being wheeled by the same driver line-up as last year. Outdoing the efforts of McLaren F1 team drivers Lewis Hamilton and Jenson Button, 2010 Formula 1 champion Sebastian Vettel rocketed to the pole around the Albert Park circuit. On a beautiful, sunny Sunday afternoon, Vettel and Hamilton led the field of 22 Formula 1 cars in total to the start of the 2011 international motorsport battle. Standing until the lights flickered off at Albert Park, the Red Bull-Renault of Sebastian Vettel launched flawlessly out of his grid position. Hamilton could only follow the German reigning champion as the full swept through turn one without incident. Having been criticized his 2010 rookie year for taking risky manoeuvres on track, Vitaly Petrov's full season of Formula 1 experience was masterfully applied on the start of the Australian Grand Prix. Rolling off 6th in his Lotus Renault GP car, Petrov was able to keep his Pirelli race tires adhered to the race surface early flying past the Ferrari of Fernando Alonso and the McLaren-Mercedes driven by last year's grand prix winner Jenson Button. Out of the first corner of the 2011 Australian Grand Prix, Vettel led Hamilton ahead of Mark Webber's Red Bull-Renault and Petrov. Though all the Formula 1 drivers made it safely through the first corner on the start, the entire opening lap was not without incident. Seven-time Formula 1 World Champion Michael Schumacher made contact in turn three when his Mercedes and Jaime Alguersuari's Toro Rosso-Ferrari. Resulting in front nose damage on the Toro Rosso and a tire puncture to the Mercedes race car, both drivers were able to limp back to the pit. Side pod damage was also reported on Nick Heidfeld's Lotus-Renault race car. Jaime Alguersuari and Heidfeld continued through the 58-lap race finishing just outside of the points-paying positions. Michael Schumacher was able to continue running on track, Mercedes car was eventually forced to retire when structural damage to the car was discovered on the vehicle's under tray. 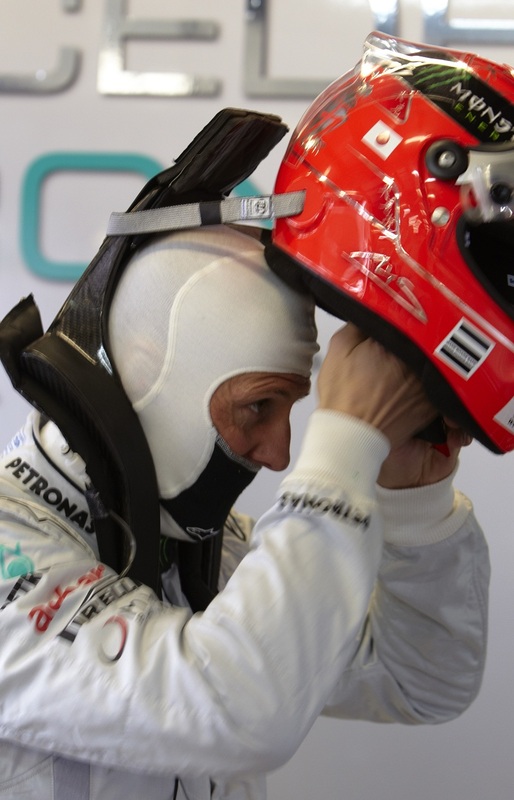 Trouble for half of the Mercedes GP team would eventually be compounded just three laps following Schumacher's car being parked. Running in 8th position managing lap 22, Nico Rosberg's Mercedes was ahead of Rubens Barrichello driving a Williams-Cosworth. Barrichello had made a dramatic grid position pick up from 17th place within the early stages of the Australian Grand Prix and began sizing up Rosberg into turn 3 at Albert Park. The Sauber-Ferrari of Kamui Kobayashi hounded the duel during that course of the event causing Barrichello to exercise some aggressive driving. So aggressive, Barrichello stormed into turn 3 in effort to overtake the Mercedes race car. In a serious misjudgement, the Williams-Cosworth impacted Rosberg's Mercedes costing both drivers a chance of World Championship points. Rosberg's car quickly lost water pressure causing the German to park the Mercedes off track near turn 13. "I saw Rubens in my mirror and he was quite far away so I was surprised that he hit me. I immediately thought that was it and I had to pull over to stop the car." Nico Rosberg said having to officially cap off the Mercedes GP team's effort in Australia. While Barrichello received reprimands from both the Mercedes team and Formula 1 stewards for causing the contact, the Brazilian testified after the race saying, "I wasn’t planning on overtaking him at that point, I was defending from Kobayashi. I think we have one tyre with grip and one with less and so we have different braking points". With Rosberg immediately out of the grand prix, Rubens Barrichello would also retire later due to a transmission issue. Enjoying what appeared to be a far too easy outing; Sebastian Vettel drove his Red Bull-Renault to victory in the 2011 Australian Grand Prix. Winning the final two races last season en route to his world title, Vettel's third straight Formula 1 victory had him finish 22.2 seconds ahead of Lewis Hamilton's McLaren after the 58-lap distance. While Mark Webber appeared able to deliver a double podium finish for the Red Bull Racing group in the early stages of his home grand prix, the Australian driver lost ground and positions in relations to pit lane. Webber would wind up 5th in the race behind Fernando Alonso's 4th place finishing Ferrari. Taking 3rd in the event was Vitaly Petrov driving for the newly branded Lotus Renault GP team. Becoming the first Russian driver ever to record a Formula 1 podium result, Vitaly Petrov remained humble on his accomplishment. "I have to say a big thanks to everyone in the team for working so hard and for supporting me over the winter. This result is for all of us and I’m totally ecstatic." With lead driver Robert Kubica suffering injury in a rally car event prior to the season, the Lotus Renault GP team 2011 planning set off kilter requiring the team to call in the services of Nick Heidfeld and reconfiguring the team to focus largely on sophomore Petrov's season. Crossing the line firmly in point-paying positions, the Sauber F1 team would find their initial double point-scoring first of the Formula 1 season reversed after the race. 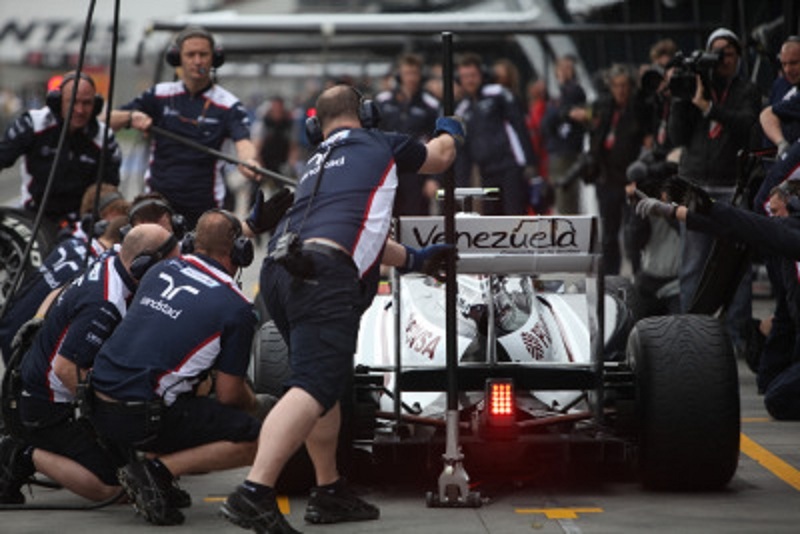 Race stewards inspection of the Sauber-Ferrari race cars uncovered the rear wing radius was out of tolerances. As a result, Sauber F1 cars were declared disqualified with drivers Sergio Pérez as well as Kamui Kobayashi losing their 7th and 8th place finishes. Filing an appeal immediately after the disqualifications, Sauber F1 would withdraw the challenge on Tuesday when the team determined there was indeed a fault made within prepping the vehicles. In a statement on their team website, Sauber Technical Director James Key “It did not bring us any performance advantage, but the fact is that it was a deviation from the regulations." The revised result to the 2011 Australian Grand Prix promoted the Ferrari of Felipe Massa to 7th and the Toro Rosso-Ferrari of Sebestian Buemi into 8th place. Bad news for the entire Sauber team, good news came to the Force India cars of Adrian Sutil and Paul di Resta will inherited the final points-paying spots. April 10th will be the date for Formula 1's second race of the 2011 season set in Malaysia.